In the making of Buffalo Magic, Novomatic has been inspired by native American culture! This slot game is a feast for the eyes as well as for the wallet. The background of the game is a wonderful, blue, starry sky. This sky is above some native American land, it’s hard to see behind the reels during gameplay, but maybe there’s a village lurking there somewhere! To the left you can see a tree and the dry grass is visible underneath the reels. Buffalo Magic has five reels and 10 paylines all in all. The reels are bordered by hand-made spears, which is just one of the small details that adds to the overall creative effect of this slot. The logo is unique and another spear in incorporated into this. Every symbol is designed to fit in with the theme of the slot. The sounds have also been created specifically for this slot! Winning combinations are celebrated with a tune from a pan flute, adding to the overall native American vibe. 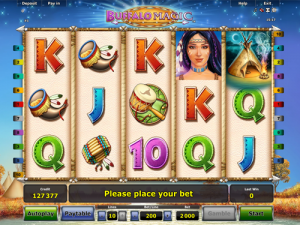 Buffalo Magic has Free Spins, Free Re-Spins and all the usual Novomatic features. A game wouldn’t be a Novomatic slot unless it gave players the option to play in autoplay or gamble their wins! It will be no surprise to Novomatic fans to see a mix of symbols – playing cards and elaborate themed symbols. The Ace, King, Queen, Jack and 10 are the symbols which, as usual, are worth the least amount of money. They all have their own unique colour and the symbols are embellished with a little triangular pattern, which makes them fit in well with the theme. As many slot games do, Novomatic plays with stereotypes when it comes to the design of the slot and its symbols and the music. There’s a native American-style beaded bracelet and a horn symbol, both decorated with feathers. A leather drum and a leather bag symbol are both adorned with buffalo pictures. These are all high-paying symbols. The highest-paying symbol, and the main character of the game, is the native American woman. She’s very beautiful and has dark hair. She’s wearing a feather headdress and a beaded necklace, and she looks rather like Pocahontas! She pays from two or more matches and the other symbols pay from three or more matches. As usual, pays are from left to right and matching symbols must fall on consecutive reels following an active payline. Wins can be gambled so long as you don’t have the game in autoplay mode. In addition to these ‘normal’ symbols, there is a Wild symbol and a Scatter symbol. Novomatic is sticking to its traditions in this respect! The Wild symbol in Buffalo Magic is a buffalo skull, decorated in native American style, with beads and feathers and art. As usual, this symbol is able to help complete wins by acting like any other symbol (except the Scatter). Also, when this symbol lands on the reels, whichever reel it lands on, the symbol will expand to cover that whole reel! So, instead of covering one position, it will cover three! Then, the game will give you a free re-spin! If, on the re-spin, another Wild symbol appears – the same thing will happen again, giving you an even bigger chance of getting a big win! The Scatter symbol is also a special symbol in this game – of course! It’s Novomatic! 3 Scatters triggers 10 Free Games! There aren’t many Native American slots from this developer but they make so many fantastic slot games. If you’ve never played Buffalo Magic before but you have played their other games, you are sure to enjoy it. It’s quite similar to: Aztec Power, Columbus, Indian Spirit and Golden Cobras. Novomatic don’t just make slot games, they are also well-known for their quality table games, like Roulette, Blackjack and Sic Bo. Despite thousands of games vendors flooding the industry with their modern games with high-quality graphics and supposedly high RTPs, Novomatic still remain one of the most popular. They don’t make things unnecessarily fancy – they just make great games. A slot doesn’t need to be HD to be enjoyable to play!